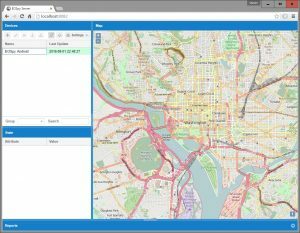 EOSpy Server — Web application (Web app) is a server application that delivers EOSPY – Executive Order Sensor Processor sYstem GPS information over the Internet through a web browser interface. The EOSPY Server main control window ties all location and environment monitoring information on one GPS Web Browser Map Screen. EOSPY Server is designed to support as many tracking devices as possible from popular GPS vendors. EOSPY Server also works with many different browsers, including your mobile phone and tablet device browser. EOSPY – Executive Order Sensor Processor sYstem Server mobile application for viewing “Real Time” live GPS Tracking information over the Internet/Mobile Cell network that does not require a monthly service subscription or fee. 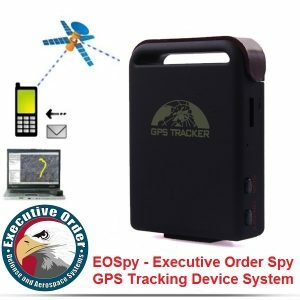 The EOSPY – Executive Order Sensor Processor sYstem Server provides information about any GPS GSM Tracking Device directly on your smartphone or tablet. EOSPY Mobile monitors buildings, vehicles and people from anywhere in the world. Stay connected and informed to what’s important. EOSPY Mobile show your GPS Tracking Devices on your Android phone map and receive Ambient Temperature, Ambient Light, and Simple Button Press information you’re your GPS Tracking Device. EOSPY Mobile can also receive IR Object temperature, Humidity Sensor, Pressure Sensor, Accelerometer, Gyroscope, Magnetometer, Digital Microphone, Magnetic Sensor, and EOSPY Mobile has Advanced Reverse Geocoding. EOSPY Client — Executive Order Spy Client Android app allows you to use your mobile phone as a GPS tracking device. It reports location and additional information to EOSPY at selected time intervals. 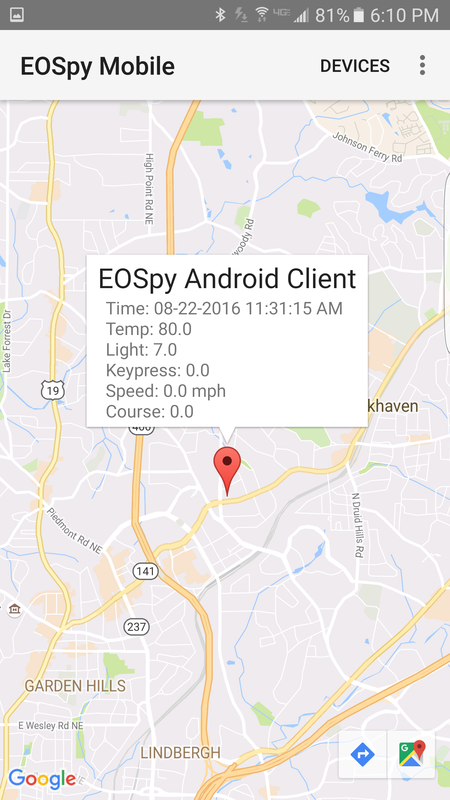 The EOSPY Client Android app also sends remote ambient light intensity, temperature and humidity information to the EOSPY live map server. Using an internet-connected or mobile cell network connected Android phone, location and environment information are at your fingertips. 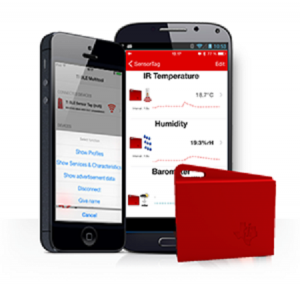 Remote streaming of additional information is of the following is possible: Ambient Temperature, IR Object temperature, Humidity Sensor, Pressure Sensor, Ambient Light, Accelerometer, Gyroscope, Magnetometer, Digital Microphone, Magnetic Sensor, and Simple Button Press, and equipment status and condition. EOSPY Windows — EOSPY Windows Desktop Application live map GPS tracking system that supports more than 90 GPS communication protocols and more than 800 models of GPS tracking devices from popular GPS vendors. EOSPY is designed to support as many tracking devices as possible. Check the EOSPY device list for supported GPS tracking devices. With EOSPY software set-up is a breeze. Just install the EOSPY windows desktop software on your computer, enter the new GPS device unique identifier and you’re ready to go. EOSPY Lite – GPS Tracking Devices – An Android lite version of EOSPY Server and GPS Device configure application. The EOSPY Lite Android application allows you to use your mobile Android phone to configure and track GPS Tracking Device. Monitor buildings, vehicles and people from anywhere in the world. Stay connected and informed to what’s important. EOSPY Lite application easily configures and programs an unlimited number of GPS GSM Trackers by sending multiple SMS to your GPS Tracking Devices. EOSPY Lite is also a lite Android version of EOSPY Server, made to track and show your GPS Tracking Devices on your Android phone map. EOSPY Lite receive light and sound warnings indicating that the vehicle position was moved. An alarm is triggered if the SOS button is pressed or the vehicle has exceeded the speed you defined. Use EOSPY Lite to Configure Many GPS GSM Tracking Devices at once. The EOSPY Lite main control window that ties all location and environment monitoring information on one GPS Map Screen on your Android device. Executive Order Spy — This quick guide will help you install and configure the EOSPY – Executive Order Sensor Processor sYstem components. 2. EOSPY Client – To install the EOSPY Client application on your phone, download the EOSPY application from the Google App Store. To start the EOSPY Client, click on the Eagle icon on your phone. The EOSPY Client screen will appear. 3. GPS Tracking Devices – Many companies make various off-the-shelf GPS Tracking devices. Configuring these devices will vary a little from vendors. First, add the new device with a unique identifier into the EOSPY – Executive Order Sensor Processor sYstem Server. Next, configure your device to use the appropriate EOSPY Server IP address and port number.